Let me just start by saying this is one of our favorites in our house. 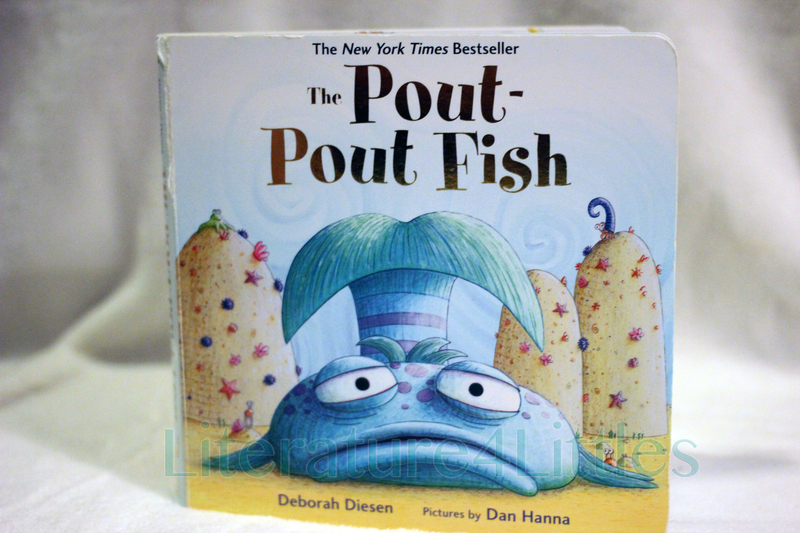 The Pout Pout Fish, by Deborah Diesen, is a NY Times Bestseller. It’s a board book, with thick paperboard pages. The Pout Pout Fish is a tale of a fish with a perpetual pouty mug (as the name suggests). His friends all try to get him to change his countenance, but to no avail… until a chance encounter changes him forever. The Pout Pout Fish is an amusing, rhyming tongue-twister of a book. It’s NOT a simple book, and it does take a bit to get through. Fidgety babies may not have the patience for it, but an older baby/toddler who can sit still for the few minutes it takes to read this book will enjoy it. There is repetition in the book, and children will likely start to anticipate and read along with those verses. As a teacher, I am impressed with the vocabulary in this children’s book. I don’t often see words like “grimace” and “aghast” in a children’s book, so kudos for that. It’s easy to see why The Pout Pout Fish is a NY times bestseller. I would definitely recommend this book for children up to Pre-K… and maybe even little later. Great review! Surprisingly, we don’t have this book, but after reading this blog post I am definitely adding it to our library! Thanks for the suggestion!